UGA College of Agricultural and Environmental Sciences researchers will host two open houses the week of June 25. From pollinators and pumpkins to corn and cattle, June is a great time to learn about what’s happening on the University of Georgia’s agricultural research farms. At the UGA College of Agricultural and Environmental Sciences’ Durham Horticulture Farm and J. Phil Campbell Sr. Research and Education Center, it’s a tradition to open the gates each summer and show off the research being conducted at each farm. This year’s tours will be held the last week of June. Conceived as a way to introduce neighbors to the farm’s research back when the 1,055-acre farm was operated by the U.S. Department of Agriculture, the center’s annual corn boil is just what it sounds like: a feast made from the corn grown on the property. Since 2013, the Campbell Center has been the hub of CAES’ sustainable row crop and pasture research. From living mulch to rotational grazing for grass-fed beef, researchers here work to make traditional agriculture more profitable and sustainable. 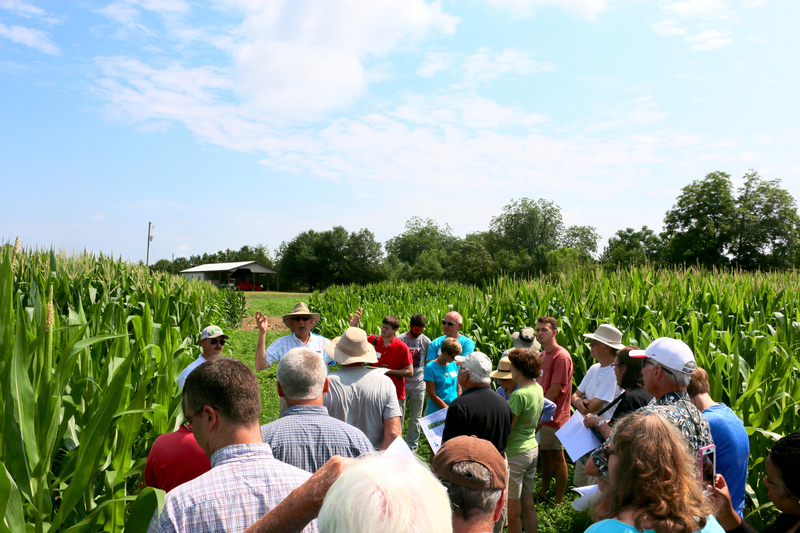 Van tours of the farm will depart every 15 minutes and will highlight the farm’s roughly 30 ongoing UGA research projects related to sustainable farming systems, nutrient cycling, water quality, organic production, livestock grazing systems, forage breeding and variety trials. Lunch will be served at about 11:30 a.m. The researchers and farm managers at Durham Horticulture Farm, which is located at 1221 Hog Mountain Road in Watkinsville, will open the gates for an evening stroll around the farm June 28 from 6-8 p.m.
For the past seven years, the Organic Twilight Tour at Durham Horticulture Farm has provided the northeast Georgia farming community and those who are simply curious about where their food comes from with a chance to walk UGA’s 90-acre organic research and horticulture farm and learn the latest information about organic growing methods. In case of inclement weather, the Organic Twilight Tour will be held June 29.